Those of your waiting for a better Instant Messaging client may want to look at Beejive's new instant messenger for the iPhone and iPod Touch. - Reliable and efficient networking: be connected 24/7, and it's gentle on your battery. - Be connected even after you close the application. Get notified instantly when you get a new message (requires with MobileMe or Exchange/ActiveSync push email). - Works with multiple IM networks, multiple accounts per network: AIM/iChat, MSN, Yahoo!, GoogleTalk, ICQ, Jabber, and MySpace IM. 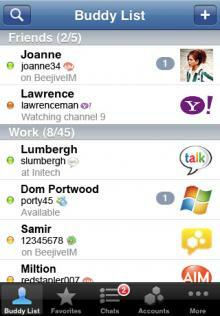 - Desktop-like instant messaging with all of your IM buddies from a single intuitive user interface. - Real-time chats: quick switch between multiple simultaneous chats. - Full Unicode support, chat in any language supported by your iPhone. - Landscape option, type with a larger keyboard. - Chat history: Email chat logs to save chat history. - SMS out, chat with your SMS buddies through AIM or Yahoo SMS out. Fully integrated with your iPhone/iPod Touch address book. - Manage your buddy-list, including add/remove, nicknames, groups, block, approve/deny requests. - Sort/group/search your buddy list. - Control your own availability, set auto-away and custom status messages, be invisible, change privacy controls. - Configurable alerts, customizable sound, vibrate settings. - Buddy icon support, view your friends' icons, set your own. Despite all the listed features, the price of the app may give you some pause. At $15.99, it's well above other instant messaging options on the iPhone. That being said, Beejive is not a newcomer to the scene. They have similar product options available for BlackBerry and Windows Mobile 6 as well. They've also long offered a web-version for the iPhone that has been well received.